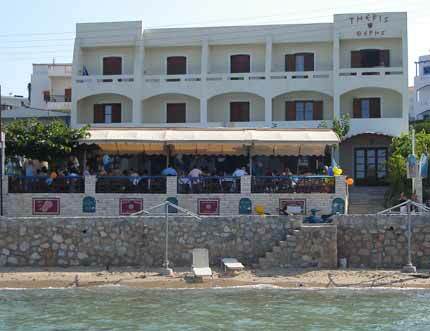 Theris Hotel is located on a quiet spot next to the beach, just 5 minutes away from Megalochori down town and only a few minutes away from shops, the entertainment district, tavernαs and restaurants. The fascinating romantic old town of Megalochori is nice for your evening walks. On the ground floor, just in front of the sea, there is a restaurant - cafe - Bar, where you can enjoy your breakfast, coffee and traditional meals cooked from fresh seasonal ingredients throughout the day. 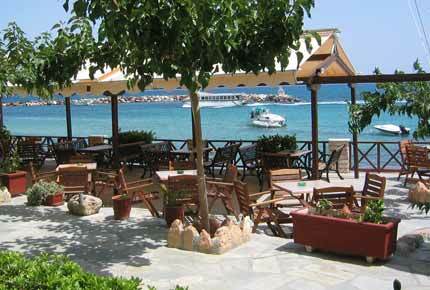 The hotel complex consists of ten rooms, fully equipped, comfortable and sunny overlooking the sea. In front of the hotel lies the sandy beach with shallow water and free deck chairs for guests of our hotel.